SalesAutopilot's API allows you to integrate your SalesAutopilot account with your own web-based applications or your website. In order to use the API, you will first need an API key pair, which is generated by SalesAutopilot. To have your API key pair generated, go to "Settings / Integration / API keys". 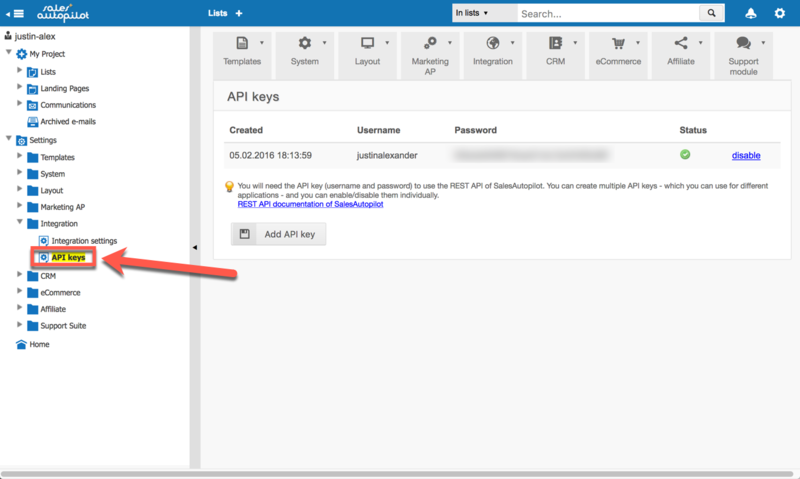 As stated in the REST API documentation, you will have to enter the username and the password you created here as the API username and the API password, respectively. You are able to create multiple API key pairs and then you can disable or enable them one by one (new API key pairs are enabled by default). This allows you to use different API key pairs for different projects and then disable them with a single click when you no longer need them or whenever you simply need them to be disabled. To disable an API key pair, click on the appropriate "disable" link. This will immediately suspend the key pair and its status indicator will change to . If you want to enable an API key pair again click the "enable" link, and the API key pair will start to work immediately.